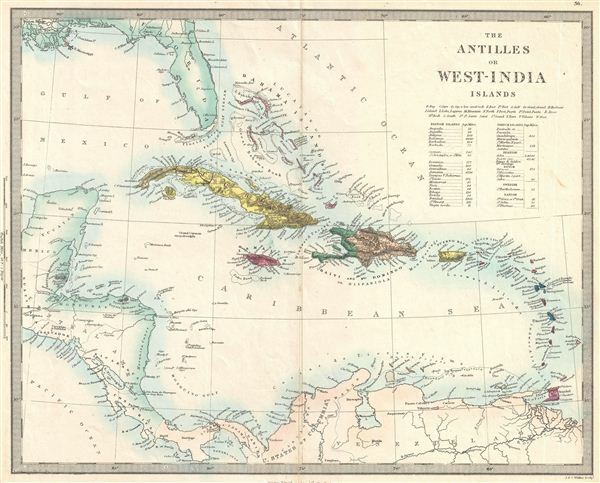 A beautifully colored 1873 map of the West Indies and Caribbean by the Society for the Diffusion of Useful Knowledge (S.D.U.K.). The map covers from Florida to the Spanish Main (U. States of Columbia) and from Guatemala to the Lesser Antilles and Trinidad. Stanford uses color coding to identify British, French, Spanish, Dutch, Swedish and Danish possessions. Relief is shown by hachure with some undersea features, such as the Cay Sal, the Florida Reef, and the Great Bahama Bank noted. This map was originally engraved by J. and C. Walker in 1835 for the 1844 Baldwin and Craddock edition of the S.D.U.K. Atlas. The firm of edward Stanford and Son, of 6 Charing Cross, London, acquired the rights in 1873 and reissued their own edition of the popular S.D.U.K. atlas shortly thereafter. Atlas of the Society for the Diffusion of Useful Knowledge, (Edward Stanford and Son, London) 1873. Very good. Minor verso repair along original centerfold. National Library of Australia, Map Rm 131. Rumsey 0890.142 (SDUK edition).